This FDA registered product is a safe and effective formulation of homeopathic human growth hormone, IGF-1, IGF-2, deer antler velvet, pituitary extract, liver extract, and alpha GPC. Below are listed the homeopathic ingredients and components found in ProBLEN HGH Plus IGF-1 & IGF-2 with a description of each. Some are components found in the deer antler velvet, which is the best known natural source of important growth factors including IGF-1, IGF-2, and EPO. It also contains at least 18 amino acids as well as other important health, fitness, and anti-aging components. It is one of the most full spectrum health, fitness, and anti-aging substances available. Human Growth Hormone (Somatropin): a synthetic hormone prepared by recombinant means and having the same 191 amino acid sequence as the hormone made naturally by the body, which is called Somatotropin. HGH is a major polypeptide hormone that is secreted by the anterior lobe of the pituitary gland; promotes the growth of healthy new cells by stimulating the release of somatomedin (IGF-1 and IGF-2), influences the metabolism of proteins, carbohydrates, and lipids. Known as the hormone of youth. IGF-1 (Insulin-like Growth Factor-1, Somatomedin C): the most important growth factor of human growth hormone. It is 10 times more potent than HGH, and it is actually IGF-1 that gives us most of the benefits associated with HGH. IGF-1 is found in most every cell of the body, it regulates cell growth and proliferation, promotes cell differentiation, enhances cell specialization, and stimulates glucose transport and amino acid uptake. IGF-2 (Insulin-like Growth Factor-2, Somatomedin A): another important growth factor of HGH. A mitogen for many cell types and an important modulator of growth and differentiation, essential for maintaining organs such as the brain/nervous system, liver and kidneys. IGF-2 is vital to the repair and maintenance of nerve cells. EPO (Erythropoietin): a glycoprotein hormone that is a growth factor for red blood cell (erythrocyte) precursors in the bone marrow. EPO is a red blood cell growth stimulant, it stimulates stem cells to increase production of erythrocytes. EPO is being used to treat various conditions such as anemia. Athletes and bodybuilders also use EPO to increase the amount of oxygen carried to muscles, organs and tissues of the body thus improving performance and increasing strength and stamina. LH Stimulator (Luteinizing Hormone): a hormone synthesized and secreted by gonadotropes in the anterior lobe of the pituitary gland. It is one of the gonadotropins that is necessary for proper sexual function and reproduction. LH stimulator stimulates the production of Luteinizing hormone (LH). In men LH acts on Leydig cells of the testes to increase testosterone synthesis and release and increases interstitial cell development, in women LH promotes the transformation of the graafian follicle into the corpus luteum, an endocrine gland that secretes progesterone. TGF (Transforming Growth Factor): is being seen as a significant growth factor in reversing the effects of aging. TGF is an ubiquitous growth factor implicated in the control, migration, differentiation and survival of many different cell types. TGF regulates cell proliferation activated by other growth factors or hormones. It aids in the differentiation of cells, inhibits unspecialized cell proliferation such as occurs in tumors, stimulates significant collagen and elastin production, aids in tissue repair, skin cell formation, immune function, and regulation of inflammatory conditions. TGF has also been shown to affect libido and mood. BMP-4 (Bone Morphogenetic Protein 4): bone-growth regulatory factors that are members of the transforming growth factor-beta super family of proteins. BMP-4's induce bone and cartilage formation, are being used in spinal fusions and for Osteoporosis. FGF-8 (Fibroblast Growth Factor 8): an androgen induced growth factor that provides broad mitogenic and cell survival activities, involved in a variety of biological processes such as hematopoiesis and tissue remodeling and maintenance. FGF's are potent physiological regulators of growth and differentiation for a variety of cells of mesodermal, ectodermal, and endodermal origin, they are involved in normal development, wound healing and repair, angiogenesis, and a variety of neurotrophic activities. They help nourish the peripheral and central nervous system nerve cells and are essential for the development of the skeletal and nervous systems. EGF (Epidermal Growth Factor): a growth factor that plays a role in normal cell growth; promotes the proliferation and differentiation of mesenchymal and epithelial cells. EGF accelerates cell growth for wound healing, and has negative growth effects on certain carcinomas. NTF-3 (Neurotrophin-3): a target-derived growth factor that neurons of the dorsal root ganglia require for survival. NTF-3 promotes the differentiation of muscle spindle afferents in the absence of peripheral targets. NTF-3 stimulates the growth of nerve fibers and is being used to treat spinal cord injuries. Spermine: a polyamine involved in cellular metabolism found in all eukaryotic cells. Formed from spermidine, it is found in a wide variety of organisms and tissues, associated with nucleic acids and is thought to stabilize helical structure. L-Arginine: stimulates the pituitary gland to release human growth hormone by blocking somatostatin. L-Lysine: important for growth and bone development, insures the adequate absorption of calcium, helps form collagen, aids in the production of antibodies, hormones and enzymes. L-Glutamate: used by the body to build proteins, may have a protective effect on the heart muscle. L-Glycine: plays a role in the synthesis of hemoglobin, glutathione, DNA, and RNA. Required for the maintenance of the central nervous system. Enhances memory and cognitive function. L-Methionine: used for normal growth and metabolism, promotes the breakdown of fat, prevents the accumulation of fat in the liver and arteries. L-Threonine: important constituent of collagen, elastin, and tooth enamel, helps prevent fat build-up in the liver, helps the digestive and intestinal tracts function more smoothly, assists metabolism, helps to stabilize blood sugar. Cysteine: may help to decrease the effects of aging, protect against heart disease and cancer, boost the immune system, aid healing, improve the production of muscle tissue, promote fat metabolism, enhance hair growth. L-Tryptophan: boosts the release of growth hormones, required for the production of niacin, helps alleviate insomnia by inducing normal sleep and reducing anxiety and depression. L-Proline: enhances fat metabolism and is involved in the production of collagen, connective tissue, and cartilage; helps support a healthy musculoskeletal system. L-Tyrosine: an amino acid that is the building block for several important brain chemicals, may aid in conditions where mental function is impaired or slowed. L-Aspartic Acid: aids in the expulsion of harmful ammonia from the body, may increase resistance to fatigue and increase endurance. L-Hydroxyroline: a nonessential amino acid that is required for the synthesis of collagen. L-Valine: part of the three "branched chain amino acids" (BCAA), promotes muscle recovery after physical exercise, promotes muscle coordination, mental vigor, and emotional calm. L-Leucine: plays a role in maintaining lean muscle, provides ingredients for the manufacturing of essential biochemicals in the body, some of which are utilized for energy, part of the three BCAA's. L-Isoleucine: needed for the formation of hemoglobin, involved in blood clot formation, assists with the regulation of blood sugar and energy levels, part of the three BCAA's. L-Phenylalanine: plays a key role in the biosynthesis of other amino acids and some neurotransmitters, is converted into L-DOPA. L-Histidine: helps protect nerve cells, aids in the production of blood cells, a precursor to histamine, stimulates the inflammatory response of skin and mucous membranes that is essential during infection. L-Serine: participates in the biosynthesis of a large number of metabolites, plays an important role in the catalytic function of enzymes. Collagen: binds cells and joints together, main component of articular cartilage. Glucosamine: the building block of cartilage and synovial fluid, a reported anti-inflammatory easily absorbed by the body. Chondroitin: a major constituent in various connective tissues, helps protect and rebuild degenerating cartilage, a potent anti-inflammatory agent. Hyaluronic Acid: a glycosaminoglycan found in the synovial fluid of articular joints for lubrication, the vitreous humor (fluid) of the eye, and the skin. It binds cartilage cells together and lubricates joints. Glycosphingolipids: compounds involved with growth and metabolism of cells and with memory and learning. Prostaglandins: hormone like substances that produce a wide range of effects, including anti-inflammatory effects. Fibroblasts: makes the structural fibers and ground substance of connective tissue. Lysophosphatadyl Choline: used in bodybuilding supplements such as ON CYCLE and OFF CYCLE as a digestive agent that facilitates the absorption and uptake of active ingredients from the stomach and intestines into bloodstream. Phosphatidyl Choline: a phospholipid, the major component of lecithin, it is also a source for choline in the synthesis of acetylcholine in cholinergic neurons. Phosphatidyl Ethanolamines: the major component of cephalin, plays a role in the biological function of cell membranes. Sphingomyelin: a member of a group of sphingolipids that occur in the body primarily in nerve tissue, a major component of myelin, the fatty insulation wrapped around nerve cells. Hypoxanthine: an anti-aging nucleotide (DNA, RNA), a naturally occurring purine derivative, evidence suggests that purines protect against oxidant-induced cell injury by inhibiting the activation of the nuclear enzyme poly(ADP-ribose) polymerase (PARP), has anti-inflammatory effects. Uridene: an anti-aging nucleotide (DNA, RNA), enhances mood. Gangliosides: promotes memory and cognitive function. Keratan Sulfate: a glycosaminoglycan found in cartilage, bone, connective tissue, and the cornea. Dermatan: a glycosaminoglycan found mostly in skin but also in blood vessels, the heart valves, tendons, and lungs. Linolenic acid: a polyunsaturated fatty acid, Various studies have shown that alpha-linolenic acid (ALA) is related to lower risk of cardiovascular disease. Calcium: essential in building strong bones and teeth, blood clotting, nerve impulse transmission, muscle contraction, regulating heartbeat, and fluid balance within the cell. Selenium: an essential micronutrient, a component of the unusual amino acids selenocysteine and selenomethionine. It also plays a role in the functioning of the thyroid gland, reduces infections, protects blood cells, the heart, liver and lungs. Trace Minerals: iron, zinc, copper, manganese, magnesium, potassium, sodium, sulfur and phosphorus. Pituitary Extract: a pharmaceutical pituitary glandular preparation. It's role is to nourish and support the pituitary gland so that it releases a more healthy amount of growth hormone. Liver Extract: promotes healthy liver function, including the synthesis of IGF-I and IGF-2, which are important growth factors that decline with age. Alpha GPC: (L-Alpha glycerylphosphorylcholine) has been found to help improve the release of growth hormone by the pituitary gland. It is a natural choline compound that is found in the brain. It delivers choline across the blood–brain barrier and is a biosynthetic precursor of acetylcholine. It is also a parasympathomimetic acetylcholine precursor which may have potential for the treatment of Alzheimer's disease and other dementias. 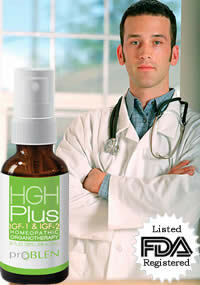 For much more information about our product click HGH Plus IGF-1 & IGF-2.